Enjoy the freedom to travel with a PowerPro Automotive Maintenance Free Battery featuring PFX Technology. 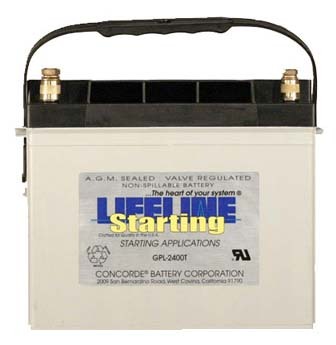 Enhanced grid construction, continuous paste mixing and a polyethelene separator combine to deliver maximum performance in this automotive battery, giving you the ability to power more of your favorite things. Whether that is a car, light truck or SUV is your choice ours is to give you the best automotive battery for your dollar. Finally, a battery that can power your vehicle for the long haul. PowerPro Premium Power Maintenance Free Batteries are designed and manufactured by the employees of Superior Battery Manufacturing, located in Russell Springs, Kentucky, USA. The commitment to integrity and product quality within our 186,000-square-foot facility is unmatched. Superior Battery celebrated 30 years of energy excellence in 2013, in a rapidly changing industry that has experienced a significant reduction in manufacturers. PFX Technology delivers maximum performance in multiple applications, improving energy conductance, heat resistance, cycle-ability and increasing the overall life of the battery. Where performance and environmental responsibility meet, you will find PFX Technology. Superior batteries are completely designed and manufactured in the United States, with 95% of raw materials in every battery generated domestically and 60-80% of lead and plastic recycled from spent batteries. Superior utilizes closed loop manufacturing processes to ensuring materials are cleaned and reclaimed in every situation possible. Creating a high-performance lead alloy strip is a science — one Superior has perfected with PFX Technology. Superior’s lead is cleaned of unstable contaminants before it reaches our facility, leaving only the chemical elements that guarantee excellent battery performance. Through an in-house, quality-controlled process, we manufacture the lead alloy used in our batteries, establishing the right chemical composition to decrease corrosion, reduce grid growth and increase battery life. Each roll of cast lead strip is inspected to ensure it meets Superior’s proprietary metallurgical and electrochemical performance standards. CPM or CONTINUOUS PASTE MIXING is a precision-metered mix that controls the ingredients in bonding paste. This process offers better performance than a standard batch mixer. A better mix = better battery performance. Though components are manufactured daily, the vast majority of our batteries are not formed — or FILLED WITH ELECTROLYTE SOLUTION — until an order is placed. Validated by date stamp, this unique feature of Superior Batteries means our distributors are getting batteries in the earliest stage of life, and consumers are experiencing fresher and longer battery performance. Be the first to review “PowerPro 12V Automotive Battery 34-6” Click here to cancel reply.